Saturday morning dawned sunny and bright. Fortunately, I wasn't up in time to see the actual dawn. Getting up on weekday mornings in the dark is enough for me. My self-appointed task for the day - garden clean up. The petunias in the deck flower boxes did poorly this year. Lack of warmth and sunshine perhaps, until too late in the season. For whatever reason, I was happy to tug them out and replace them with dark purple pansies that will provide a bit of colour throughout the winter. Next, I harvested all the tomatoes lingering on the vines. Three large shallow bowls hold green and semi-ripe tomatoes on the dry sink. I'm hoping they will eventually ripen. After pulling the vines and the accompany weeds, I planted some fall starters - spinach, lettuce, and cauliflower. This is something new for me - fall gardening. I'm not certain that I like it. Autumn is usually the time to put the garden to bed for the season and take a break. However, in an effort to grow a little more of our own food, I've made the effort. We'll see what the result is. I planted 6 lettuces in the beginning of September and we're now harvesting enough for a salad every other day or so. Spreading compost over the garden in the spring means lots of volunteer plants. These are mostly tomatoes and squashes, but this year, I discovered a number of avocado plants. So I rescued three of them and planted two of them in a pot which I left outside all summer. It's still sitting on the deck. The other I found on Saturday and brought it into the house. The plants grow well although I have no illusions of ever harvesting an avocado from them. More's the pity since I do love avocados. We had them on our property in Ecuador, along with lemon trees. We brought the table up from the lawn to the deck. Whoever planned this house didn't think much of privacy. The deck is in full view of two streets and I'm not about to have my dinner out there. On the other hand, there is a beautiful view of the mountain from the deck, easily visible over the tops of cars and passersby. Still - I prefer eating in privacy. These herbs, rosemary, thyme and variegated sage, should survive the winter in their pots and they provide a little more life to the deck. and it has me thinking about how we eat. We meaning my husband and myself. We've often joked that if our food consumption was dependent on our production of food, we'd be dead in no time. I love harvesting fresh food from the garden and eating it during the summer, but my focus is not preserving food for the winter, as my grandmothers and mother once did. I do make jams and jellies from fruits in season, freeze large quantities of berries, can a few pints of tomatoes, dry a few more and so on. I like buying locally produced meat and cheeses, but only when convenient. (Right now it's a 15 minute walk to the Cheeseworks where a deep freeze also holds beef, pork, and lamb.) The thought, though, of relying almost solely on local or my own food production is daunting. It would be a full-time job for the spring and summer. Have any of you read this book? What did you think? How much food do you produce or buy locally? Sounds as if your garden did way better than ours this year. The critters managed to find ways into our area no matter what we did this season. We managed to get two peppers and one tomato. Everything else would start growing and just when we would think in a day or two that watermelon, or cantalope, or those peppers or that tomato will be almost ready... We'd come out the next day to find them eating and the vines nipped from the ground. Been a very frustrating year. Yes, we'd be in trouble here as well, if we had to depend on just what we harvested. I guess we'd take up hunting and be even more grateful for that hunter son-in-law. What I find mildly disturbing is that so many are talking about needing to be self-sufficient. The times we live in are unsettled at best. No, I have not read the book nor any like it. Gosh! I produce non of my own food...and buy very little that is locally grown...but I do try. Loved the avocado trees in our yard when we lived in California! If we'd had to feed ourselves this summer we'd have starved. For all the tomatoes we planted we had very few actually ripen - it was too cool and damp. We raise our own chicken to eat, and we have other hens who give us eggs. I guess we could raise our ducks to eat as well, but we've never done that. The goats live a good life and I wouldn't eat them unless I was starving. I haven't read that book, but I have read Carolyn Herriot's The Zero Mile Diet and it was helpful. We grew plenty of summer vegs and salad this year but it wouldn't have been enough on it's own to keep us from starving! We shop very locally and know the source of almost all of our food - eggs, milk, cheese, fresh meats, bread & charcuterie etc. I haven't read the book but will have a look for it, it sounds interesting. I would definitely starve. We raise our own beef and have a plentiful supply of milk...and those two things are not my favorites. Our hens will soon be laying...and we have garden fresh veggies in the summer. And the rest we purchase...local, if possible. But I always think that if we had to live off of the land...we could. It's easier to buy! If health and finances were not an issue I would love to live on some property where I could raise chickens and livestock and grow my own veggies and berries and fruit trees. I did quite a bit of container gardening this summer but did not have much success. A couple of pepepers that were quite bitter, several handfuls of cherry tomatoes, beans were pitiful, strawberries next to nothing. My peppermint and spearmint did well, chives, garlic, rosemary and oregano, not so much. I try to buy local produce whenever possible. Great post, Lorrie, on an important issue. See you are managing to get the autumn garden jobs done. We used to have an allotment and grew a lot of food but it became too much eventually. We do have some good farm shops locally but go occasionally as an addition to grocery store. I read it when it first came out. They made a profession out of self sufficiency, didn't they? I can't be doing with that. I really need to get out into the garden too. I seem to have lost the gardening drive recently, the place is a mess. If I do nothing else, I must get out there and protect vulnerable plants before the frosts come in earnest. A lovely "clean up the garden"-post. Lucky you to have greens all through the winter. Here everything will be frozen and snow covered. 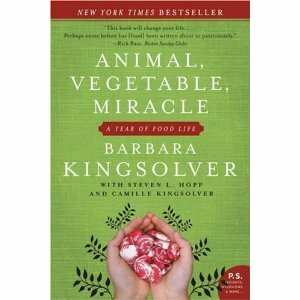 I read Barbara Kingsolver's book when it first came out. We were almost self sufficient when we lived in the Okanagan but haven't been so these past 10 yrs. We preserved everything we grew and bought for our family of six. Now I'm enjoying baking a few pies, mixing a few frozen berry drinks, and making 5 or 6 jars of jam. I loved the book, but I am a big Kingsolver fan. We try to grow a lot of our produce now...in a backyard garden and community plot. We also frequent the farmers market in town on Sundays. Come the end of November through April, it will be the supermarket for us. I try to buy organic but can't always afford it. This was a good post..interesting. I haven't got your stamina! It must be very satisfying to be so self-sufficient, but I do not do all of that growing myself. Only a few things come from my garden.